This one-of-a-kind book is our best seller – and it’s easy to see why! The handsome personalized book contains every birthday front page of the New York Times for someone’s entire life. What a marvelous stroll down memory lane for the recipient! The outside is personalized with the recipient’s name and birth date in an elegant gold script. Inside the book are all the birthday front pages (with the pages after 1988 printed in full color). It also includes a 19 page timeline that features the 20th century highlights and 10 extra blank pages for personal mementos and recollections. 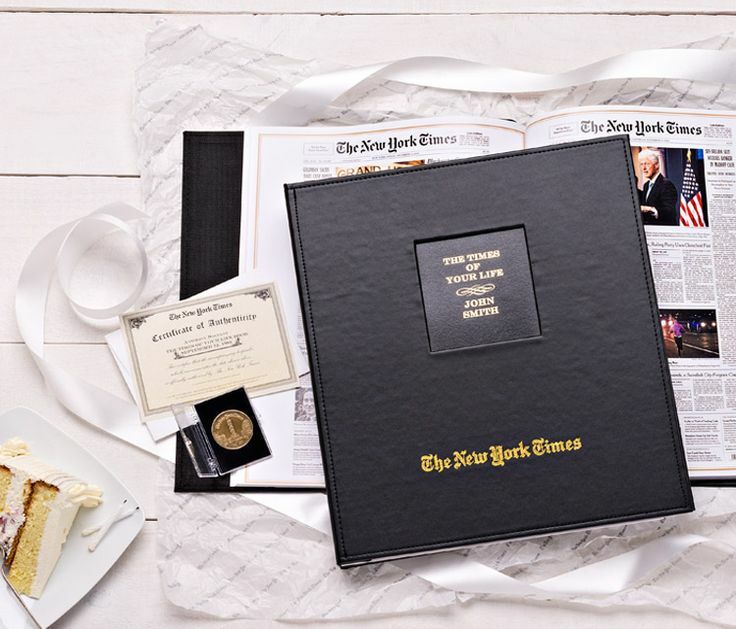 Included with the gift is a bronze keepsake coin that is engraved with the chosen date on one side and the historic New York Times building on the other. A marvelous gift that is perfect for any milestone event – birthday, anniversary, or retirement!